qlwm in almost-default mode (I've moved the taskbar to the top and removed the default biff application that would normally sit by the clock). 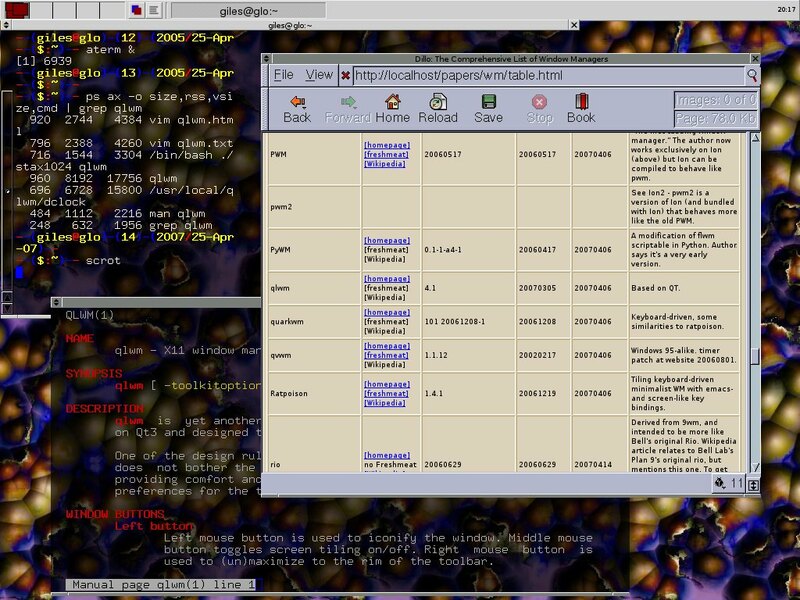 * biff and dclock are part of, and built with, the qlwm package. Requires QT4 devel files to compile (there are older versions of the WM at the site that go with QT3 and QT2, although they're now unmaintained). You probably will have to compile, I haven't seen any binary packages. Written in C++. No mention of standards compliance. Windows aren't shaped. Windows can be minimised to the taskbar. Tiling mode is supported. Taskbar has a pager with three (default) virtual desktops. Desktop mouse clicks do nothing. The man page is quite good, providing extensive information on mouse usage and key bindings. It tells you where config files are kept, but doesn't discuss modifying them. The config files are reasonably well commented and not too hard to work with. Windows are decorated. See the "Discussion" section below. The author likes the reliance on Qt, because it means the WM itself can be coded relatively easily, is easy to maintain, and remains small. But small code comes at a price in this case, that being a reliance on Qt and the bloat it brings when the WM is compiled. You see this in the memory usage indicated above. This isn't a big problem on most machines these days, but I prefer more efficient memory usage. I should point out it's pretty easy to turn off dclock and biff in the configs if you don't want them. My favourite feature of this WM is a relatively non-obvious one: Alt-F10 toggles tiling mode, in which the visible windows tile all space on the desktop, with the window with focus getting the lion's share (70% of the screen on the left) of the real estate, and Alt-F11 toggles "screenmode," in which the focused window gets ALL the real estate, including the removal of window decorations and the task bar. In both cases, Alt-Tab and Alt-Shift-Tab allow moving from window to window: bizarrely, in tiling mode Alt-Tab moves the window you've focused to the big section of the screen. This is disconcerting, but I think I like it. Default focus behaviour is sloppy focus, with a delayed autoraise that kicks in in about 3/4s of a second - if you leave the pointer over the window. This is a little odd, but works out okay once you get used to it. Alt-Tab works similarly to MS Windows and many other WMs, but not exactly as I've come to expect: it cycles through windows in some arbitrary order (perhaps oldest-to-newest?) rather than current-to-most-recently-used, which is more common. Except in tiling mode, in which case it does current-to-most-recent. Weird. Window decorations are Fluxbox/Window Maker-like: iconize in the upper left, kill in the upper right, pull tabs to resize in the lower corners. You can't resize from the sides or top, although you can pull the bottom edge (which is different than Fluxbox). Styles are mentioned in the config files: changing them didn't change the appearance of the WM, I may not have needed files installed but I didn't see this mentioned anywhere. When I initially started the WM, the titlebar font was too large and ran off the bottom of the titlebar. I fixed this in the config by making the titlebar a bit taller. The taskbar defaults to the bottom edge of the screen - I used the config files to place it at the top as seen in the screenshots. The default setup includes three desktops managed by the pager (at the left end - I have five), a window menu, a task and application menu, minimized windows, and biff (I removed it) and a clock. One quirk of the taskbar is that until an application has been minimised, it doesn't appear on the taskbar. I had minimised and restored one window in the screenshots.